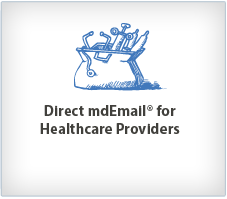 Direct mdEmail ® users can communicate and share structured or unstructured data via the National Health Information Network with other healthcare organizations, providers, hospital systems and application service providers. MaxMD is a HISP designed to meet the NwHIN Direct Project guidelines by enabling full confidentiality and integrity. Our technology also provides end-user access reporting for compliance needs. Our tool enables your business to reduce costs and increase efficiency. 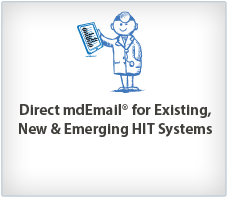 With Direct mdEmail® capabilities you can reduce capital expense on outgoing post mail and non-HIPAA compliant faxes. Replace variable paper cost with secure fixed digital costs and easily transform your current system to a cost effective & HIPAA compliant solution. With our advanced technology you can send emails with confidential health information to any email address on the web and trust that your exchange is secure without the need for special software or hardware. SendAnywhere enables Direct mdEmail® users to communicate beyond the secure NwHIN network and exchange information with patients, peers and business colleagues. Max Direct mdEmail® solution is conveniently integrated into your existing mail server with minimal workflow disruption. Draft and send your confidential emails containing ePHI (Electronic Protected Health Information) or other protected information via Direct mdEmail®. Communication can be sent to any email address on the web, without the need of special software or hardware. Recipients receive an encrypted message that only they are able to authenticate. Encryption is virtually transparent for end-users. Messages are opened on the recipient′s desktop. Our gateway is available for hosted email and enterprise solutions (deployed on internal mail servers). Our secure email solution is configurable to small, medium and large businesses. mdEmail™ technology is available without invasive internet technologies such as tracking cookies, scraping, sniffing, monitoring or advertisement cluttering.